Has Blue Beetle had the most origins of any comic book hero? I seriously wonder about that. DC has told at least four variations on the tale, whether of Ted Kord or Jaime Reyes. And they don’t even really acknowledge the earliest incarnation of the character, who was basically just the Green Hornet under a different name. But, undeterred, Giffen and Kolins trot out a new take on the hero in Blue Beetle #4, using all three of the men who have used that moniker at one time or another. Of the three men, Jaime is the only one being open and honest in this outing, sharing with Ted Kord how he spotted the scarab in a river. His two friends each tried to make contact with it first, and suffered horrible results, but when Jamie reached out the scarab instantly bonded with him. Ted avoids telling Jaime that the scarab has bonded to the boy’s spine, and removing it will kill him. A flashback lets us see that Ted Kord at least tried to become Blue Beetle in the rebirth reality, having created a suit and weaponry, and getting the name from Dan Garrett. Did he actually suit up and fly his bug into battle? At this point that is not clear. Bringing back Dan Garrett was an interesting choice, which opens up a new door. 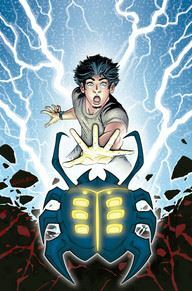 Dan is given his old job, as an archaeologist, and is shown to be in possession of a Blue Beetle scarab, though whether it is the same one currently in Jaime’s body is not clear. Kolins art is excellent throughout, and Giffen seems a bit more concerned with plot than with snappy banter in this outing, which is not a bad thing. I always love reading his dialogue, but he can get a little too sit-com at times. I also love the way Dr. Fate is being used in this book, and the way Kolins illustrates the character. Is this the same Dr. Fate that so recently had his own book? I am not certain at all about that. He both looks and acts differently. More like the classic Dr. Fate of Earth-2. Is this another hint that the classic JSA will be returning?